On April 11 1987, more than 40 years after his rescue from Auschwitz, Primo Levi fell to his death in the block of flats where he lived in northern Italy. The authorities pronounced a verdict of suicide. Levi had pitched himself three flights down the stairwell. Not since Pasolini was found murdered on the outskirts of Rome had there been such clamorous coverage in Italy of a writer's death. "Italy mourns the maestro", ran the front-page headlines. 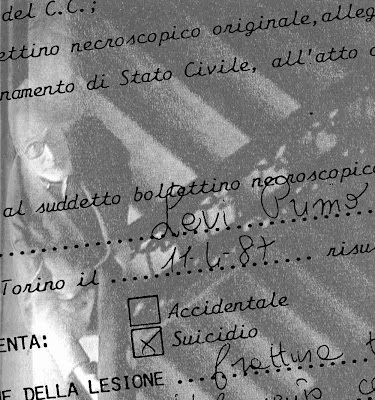 Twenty years on, it remains hard for friends and admirers of Levi to reconcile the calm reasonableness of his literary intention - to furnish "documentation for a quiet study of the human mind" - with so violent a death. Levi's chronicle of Auschwitz, If This Is a Man (1948), remains a marvel of luminous precision and poise. Yet there are collective condemnations, coloured by the author's rage, of the German people. At one point the Germans are addressed aggressively in the vocative - "You, Germans, you have succeeded." Any German who had shown Levi a scintilla of humanity in the camp - and there were several - is pointedly omitted. Only in later life would Levi investigate the exceptions that defied the stereotype: the good German, the kind Kapo. A complicated, difficult man, Levi was noted for his determination to keep secret what he wished to keep secret. He wrote almost nothing of his immediate family, and other people are often alluded to in his books by their initials only. His late essay collection, The Drowned and the Saved (1986), typically contains many elisions and concealments. In one chapter Levi refers to a German admirer of his as "Mrs Hety S". A number of other survivors and even former Nazis were in correspondence with "Mrs Hety S"; her letters were treasured (and carefully collected) by all who received them, including Albert Speer, the Nazis' armaments minister. But who was "Mrs Hety S"? We learned that her former husband had been a chemist for IG Farben, the German chemical giant that operated out of Auschwitz and other camps, and for which Levi was forced to work; but more than that, Levi does not say. In the hope of identifying the mystery correspondent for my biography of Levi, I placed advertisements in a number of European journals and newspapers, asking for information. The response was good. A film-maker in Holland telephoned to say that the daughter of "Mrs Hety S" had given her a copy of the entire correspondence.